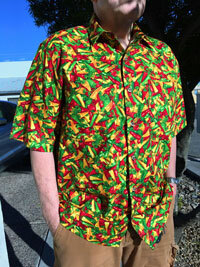 NEW PATTERN: "Caliente" Sold Out! "Having lost our original shirt-maker to medical retirement, our popular Sonoran Shirts have been on hiatus this year -- we feared permanently. Due to the quality and complexity of the Sonoran Shirts, our search for a suitable replacement was long and thorough. We're glad to report that we finally connected with a talented new shirt-maker who takes great pride in their work and has agreed to manufacture for us in-house. There is a modest increase in price due to labor, but the results are qualitatively worth it. We have appreciated the praise and patronage of our loyal shirt customers and collectors over the years. It was your continued die-hard interest that kept us pushing for a solution and we are pleased to bring these signature shirts back." Our premium Sonoran Shirt line combines Hawaiian style with a Southwestern flavor that has been largely missing from the concealed carry world. Meant to be a truly low-profile concealment garment, its attributes are subtle. Our Gen. II Sonoran Shirt has evolved with fresh patterns and updated pockets featuring an inner organizer pocket that keeps items separated and prevents the pocket from bagging out. The bisected, flat organizer pockets are perfect for cell phones (including smart phones), iPod or iPhone, pens, business cards, even 1-cell SureFire flashlights. The standard full-sized pockets are still available for envelopes, notepads, etc. Cut slightly larger at the waist (1" extra girth) and longer (1/2") than most Hawaiian-style shirts, the Sonoran Shirt will even cover most belt holsters. Even if you don't carry a gun on the waist, modern living has added everything from iPods to cell phones to PDAs to our waistline. Many people have found the larger cut works just as well for these lifetools as well. Twin shirt pockets allow the contents of the two sides of the shirt to be balanced if worn as an open-front covering garment with a tank or t-shirt. We opted not to use vents on the sides of the shirt due to the risk of exposure or entanglement of weapons that we have experienced in the past. Ever get annoyed by the tag in the collar of your shirts? We did too, and solved it by placing our maker and care tags at the bottom of the buttonhole placket. Limited runs of various prints ensure that our shirts will be hard to identify as covering garments. However, if you want a specific print you might want to jump on it as we rotate about every six months. We have a few rules for deciding what makes a pattern suitable for a Sonoran Shirt. We prefer a design that aids in breaking up any "printing" from a concealed handgun or magazines. However, our patterns are also chosen to reflect the flora, fauna, landscape, and culture of the beautiful Sonoran region, including the Baja California Peninsula and the Sea of Cortes. If it is native or imported to the Sonoran Desert (central & southern Arizona and northern Mexico) and lives or grows here (including our many lakes) it's fair game to show up on our shirts! Really, they aren't so much rules as guidelines. Made in the U.S.A. in our own production shop (yes, we do make them right here in Phoenix, our little corner of the Sonoran Desert). While these are generously cut (1" added girth, 1/2" added length), we still recommend ordering your regular size. High-quality 100% cotton construction unless otherwise noted. Cold wash, cool iron; some shrinkage may occur. Whether it's camping or casual Fridays, Woolrich Elite pants or Dockers, the Sonoran Shirt will keep you cool, stylish and under the radar. *WHILE OUR WEB INVENTORY IS USUALLY CORRECT, DUE TO IN-STORE AND PHONE SALES IT IS OCCASIONALLY INCORRECT. WE WILL ATTEMPT TO MATCH YOU WITH ANOTHER SIMILAR PATTERN THAT IS IN-STOCK IF THIS HAPPENS. SONORAN SHIRTS ARE ALL LIMITED-RUN DESIGNS AND WE TYPICALLY HAVE ONLY ENOUGH MATERIAL OF EACH PATTERN FOR A FIRST PRODUCTION RUN. PLEASE CALL TO CONFIRM AVAILABILITY IF YOU REQUIRE IMMEDIATE DELIVERY.